All-in-One Premium Kit with Professional Air Compressor, 3 Airbrushes & 6 Createx Colors. Our kits are perfect for drawing, painting, cake decorating, cosmetics, nail art, temporary tattoos, auto-body works, crafts and many other hobbies. We have a wide selection of kits and accessories to choose from, be sure to check our store out. The all-in-one professional kit, it has everything you need to get started. Premium system for all levels of users. Designed for users who need high quality spraying effect. Quite and durable professional compressor. Portable light weight and easy to carry around. Made with high quality precision components that enable the airbrush to work efficiently while providing exceptional atomization and accurate spray control. Maintenance free, Oil-less Piston motor and Quiet. Auto-stop Energy Saving: Pressure start at 30 PSI and stop at 45 PSI when not spraying. This enables a longer compressor life from less motor wear and heat moisture. Internal hot protection device, the compressor will auto cut off the power when its about to over heat, and reset after the motor cool down. Portable with a easy carrying Handle. Type: Single Cylinder Piston with 0.3 Liter Air Tank. Pressure: Start at 30 PSI and Stop at 45 PSI. Air Flow: 2030 Liter / Min. Dimension: 6.3" x 5.9" x 6.9. Includes: Inlet and Outlet Air Filter, 6ft Air Hose. 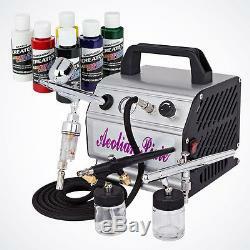 C2-28PS Siphon Feed Dual-Action Airbrush. Multi-Purpose High Performance Airbrush from Beginner to Advanced. Siphon Bottle: 3/4 oz (22 cc). Fluid Cup: 1/6 oz (5 cc). Spray Pattern: Fine line to 2 Wide. The spray pattern is in accordance with the distance between the work surface and the Airbrush. Applications: Illustration, Commercial Art, Custom Automotive, Cake Decorating, Cosmetics, Temporary Tattoos, Crafts and Hobbies. Color Media: Watercolors, Acrylics, Inks & Dyes, Automotive Urethanes, Lacquers, Enamels. Includes: Siphon Glass Bottle, Cup, Pothook, Cap,ner, Storage Case. Dimension: 6" x 1.25" H x 3.5 W. C2-30A Gravity Feed Dual-Action Airbrush. Gravity Feed: 7cc Fluid Cup with lid. Easy fluid refills and easy cleaning. Removable back handle cover for adjusting the thin spraying line. Hose Connector: 1/8 with removable cover. Includes: 2cc Eye Dropper, Nozzlener, Storage Case. Dimension: 5.5" x 3.25" x 0.35. C2-38 Siphon Feed Single-Action Airbrush. Great Starter Airbrush for Beginners and Students. Single-action trigger air control with Adjusting Nozzle. Spray Pattern: from 1/4" to 1-1/2" Wide. Includes: (Two) Siphon Glass Bottles, 5'ft Vinyl Air Hose, M5 female to 1/8 male Fitting, Propellant Regulator, Storage Case. Dimension w/ Bottle: 5.35" x 3.5" x 1.5. 6 Createx Primary Airbrush Colors. Opaque Colors are solid colors intended to cover underlying colors and surfaces with 2 - 3 coats. Opaque Colors make excellent base colors. For many projects, starting with either Opaque White or Black works best as other colors types will cover quicker with vivid, brighter effects compared to applying colors, for example Pearlized or Transparent, direct to substrate without base of opaque White or Black. Opaque colors work best with larger tip-sized airbrushes operated at higher PSI settings. For fine lined detail, lower PSI settings and small tip-sizes, Transparent Colors work best. Transparent Colors are bright, vibrant colors which do not have fillers for opacity. Most often work best over a bright surface or base color such as Opaque White. Transparent Colors should be used for fine-lined detail operated at lower PSI settings through smaller tip-sizes. For 0.2mm tip-sizes, reduce Transparent Colors with Reducer. Transparent Colors blend with underlying colors when faded over for blended color transitions. Transparent Colors are the most common graphic paint used by artists after the base color has been achieved. Come in easy-to-use flip-top dispenser bottles. This set includes 6 different colors. Opaque Black (2 oz) - Solid. Opaque White (2 oz) - Solid. Brite Red (2 oz) - Transparent. Brite Blue (2 oz) - Transparent. Brite Green (2 oz) - Transparent. Brite Yellow (2 oz) - Transparent. 1x Pro Air Compressor (C1-176). 3x Siphon Glass Bottle (22cc). 1x Metal Fluid Cup (5cc). 1x Vinyl Air Hose (5ft). 1x M5 female to 1/8 male Fitting. 6x Createx Primary Colors (2 oz). If you have any problem. Including the original accessories and all packing materials. If you have received the item in a damaged condition, please notify us within 3 days after receiving. Please keep your accessories and all packing materials in new condition in order to return. All messages will be responded to within 12 - 24 hours. The item "New 6 Colors 3 Airbrush Kit Air Compressor Dual-Action Createx Primary Paint Set" is in sale since Friday, September 06, 2013. This item is in the category "Crafts\Art Supplies\Painting Supplies\Airbrushing Supplies\Systems & Sets". The seller is "funhobby" and is located in Fast & Free Shipping!. This item can be shipped to United States, Canada.